One of the worst problems you can get in a hydroponic crop is mildew. Year after year I see growers lose significant amounts of production due to this disease within a variety of different crops. Powdery mildew reduces yields, stunts plants and - if contracted early on - will possibly cause a complete loss of your crop. It is generally hard to control once it gets in and it will expand like wildfire through any commercial growing operation. Today we will be discussing how to actually prevent mildew from ever appearing - without using toxic fungicide applications - and why prevention can play a huge role in ensuring you never have to face this problem in the first place. Fungal spores are generally carried by the wind and by insects, making it very hard for a crop to avoid ever coming into contact with the pathogen. Wild plants or plants from other commercial crops close to you will most likely have the disease and millions of spores will get in the air and eventually reach your plants. It is only a matter of time till the powdery mildew reaches your crops - almost impossible to prevent - so you must make sure that your plants are strong enough to prevent the pathogen from taking hold. 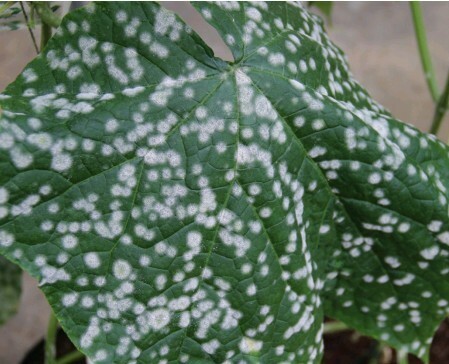 There are two main factors that affect whether powdery mildew will infect your plants. The first is plant strength and the second is the environment. If one of these two is not at its best then your plants will fall prey to this fungal disease. Neither strong plants under bad environmental conditions nor weak plants under ideal environmental conditions will be safe from the disease. So what can we do to ensure our plants are healthy and our environmental conditions are safe? One of the proven methods to make plants strong against fungi is silicon. 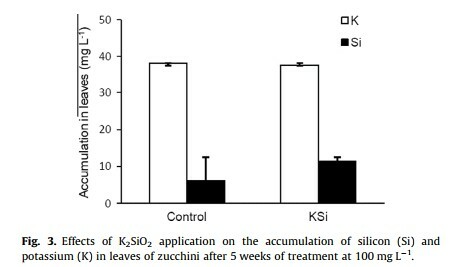 Potassium silicate applications - as soil drenches or foliar sprays - have proven to increase disease resistance across several studies (see here and here for examples). But other innovative approaches using other forms of silicon - for example nanometer sized silica crystals - have also yielded good results. In this and this studies it was clearly shown that other forms of silicon - besides silicate - could also help in preventing fungal disease. This might be preferred in some cases as these forms of silicon can be far more stable and easier to store/apply compared with options like potassium silicate. However silicate applications are no miracle. If your environmental conditions are not set properly the silicate applications will be useless. This is the reason why some growers say that silicate does nothing against disease, because an environment that's favorable for fungi can basically nullify the protective action of supplemental silicon. This was demonstrated by cucumber growers who had a lot of success with Si supplementation in Canada to prevent fungal diseases, but failed to reproduce this success in Florida. A study about this difference revealed that the higher temperatures in Florida negated a large part of the benefits from silicon supplementation. If you want silicon to work against disease better stay in the 20-25°C range. Other microorganisms can also be of great help in preventing powdery mildew. If a leaf is already colonized by beneficial fungi or bacteria it will be much harder for a pathogen to get in. Several species of microorganisms have been studied in this regard. Fungi like Tilletiopsis have shown to prevent and control the disease (see here), other microbes have also been studied in conjunction with silicon (see here and here), showing beneficial effects. Fungus like Trichoderma harzianum and bacteria like bacillus subtilis have also shown induction of systemic resistance against fungal diseases (see here, here and here). The two images above were taken from this study. Friendly chemical solutions are also available for the prevention of powdery mildew. Plant derived extracts, for example neem seed oil at 1% has shown to be a good agent for powdery mildew prevention in okra (see here). Substances like salicylic acid have also shown to trigger resistance to powdery mildew in plants like peas (see here). There are also additional alternatives dealing with the environment that can make it difficult for fungi to colonize plants by attempting to make the environment more hostile for fungi. Spraying ozonated water has shown positive results in experiments with tomatoes (see here) as well as electrolyzed water in strawberries (see here). Keeping the environment conditions within a proper range is also important, this paper shows you how environmental conditions affect powdery mildew disease severity in sunflower but the general features are applicable to most higher plants. 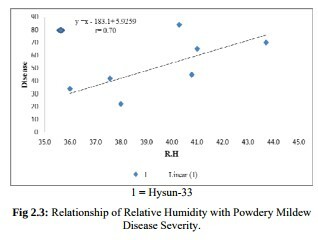 As you can see in the image above - taken from this paper - disease severity increases with relative humidity. In general you will want to keep your relative humidity below 70% to avoid making the environment extremely friendly for fungi. In the end there are many things you can do to keep your plants free of foliar fungal disease like powdery mildew. Use lower temperatures, control your relative humidity, do silicate and salicylic acid applications and use beneficial microbes. If you follow these steps you will forget that powder mildew ever existed! Agsil 16 is a fully soluable KSI source for you remo Dr. Daniel Fernandez, the link to the last cited paper has a technical error. It needs a web source. It currently has a local link. I enjoy your blog. Looking forward to the second part of you led lighting. Hi Random, Thanks for posting. Sure, AgSil16H is a good source of potassium silicate you can use (which I refer to in my post about silicate in general), however there are many other sources so I didn't want to go straight to an AgSil16H reference. I have now fixed the last link within the post. Thanks for reporting, Best Regards, Daniel PS: That second part LED post should be coming up this month! AgSil16 was a recommendation for poster Remo, as it is a inexpensive fully soluble salt for a nutrient solution. There are many other options, of course. Dr. Daniel Fernandez I have just subscribed to the rss feed, so I'll see future blog posts immediately.